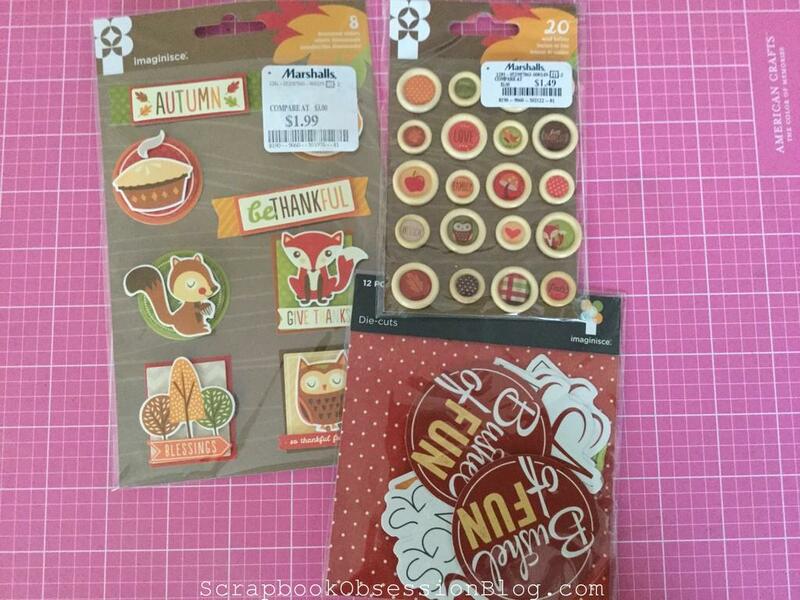 Have Discount Department Stores Become the New Local Scrapbook Stores? 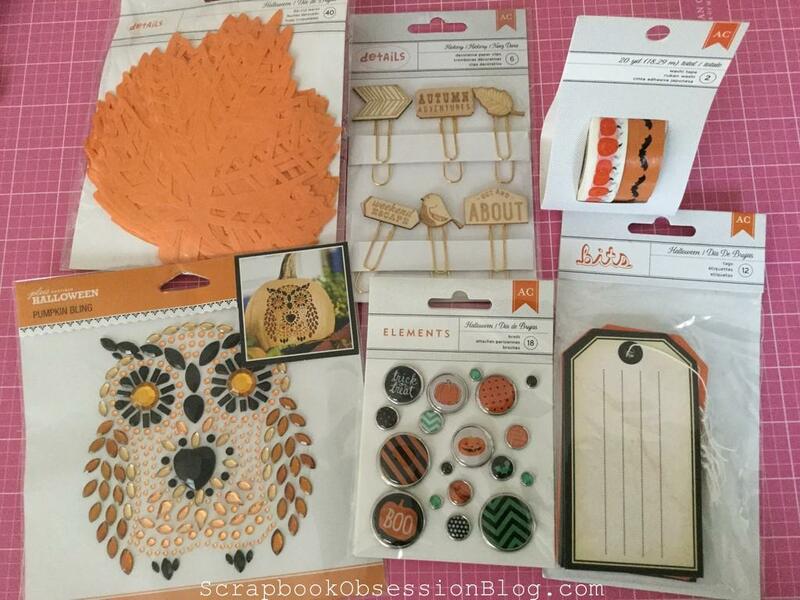 So my scrappy friend Janet shared this haul video where scrapper Tasha shared her recent finds from TJ Maxx. What’s crazy is that the fall and Halloween items that TJ Maxx is carrying – just came out! 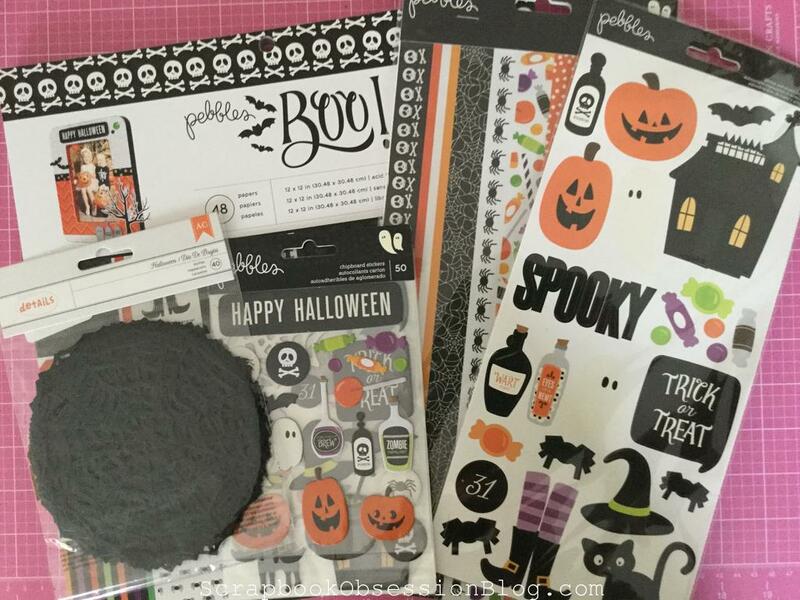 They include items like: Imaginisce wood buttons and dimensional stickers, Pebbles dimensional stickers, American Crafts Halloween tags and Details gold arrows and camera clips, and Crate Paper “After Dark” sequins, pumpkin Standouts, and Party Favor Bags, Elements spider brads, Pebbles enamel dots and 12×12 pad called “Boo”. 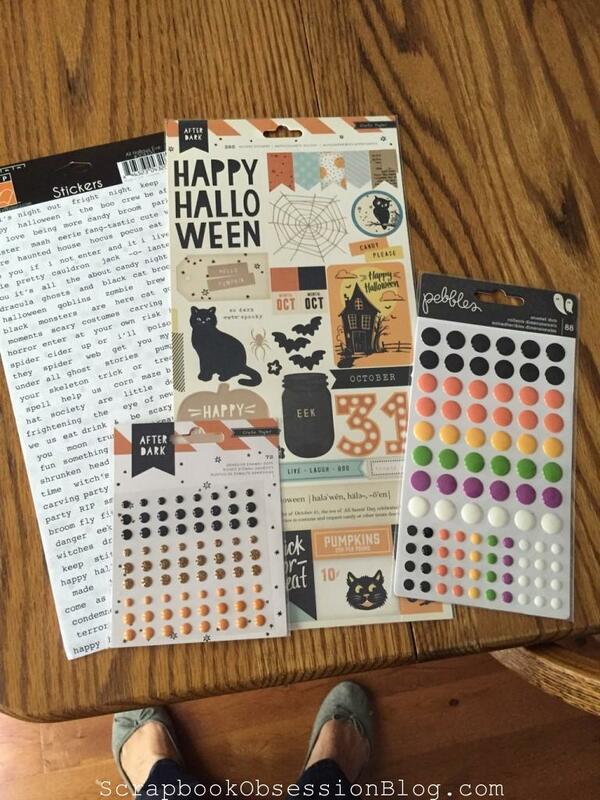 Most of the embellishments were $1.99 and the paper pad was $5.99. The Amy Tangerine “Authentic” roller stamp was $2.99. So that set off a TJ Maxx shopping frenzy and my online scrappy friend Deb found all of this magical scrappy goodness at her TJM and Marshall’s! Not that this will send you off shopping or anything, but hypothetically if you were looking for these things, try everywhere in the store. Sightings have been reported in the stationary aisle, the Fall/Halloween aisle, the checkout aisle, etc. I haven’t had a chance to check my TJ Maxx yet (don’t have Marshall’s) but they don’t usually get much and if they do, it lags behind everyone else. 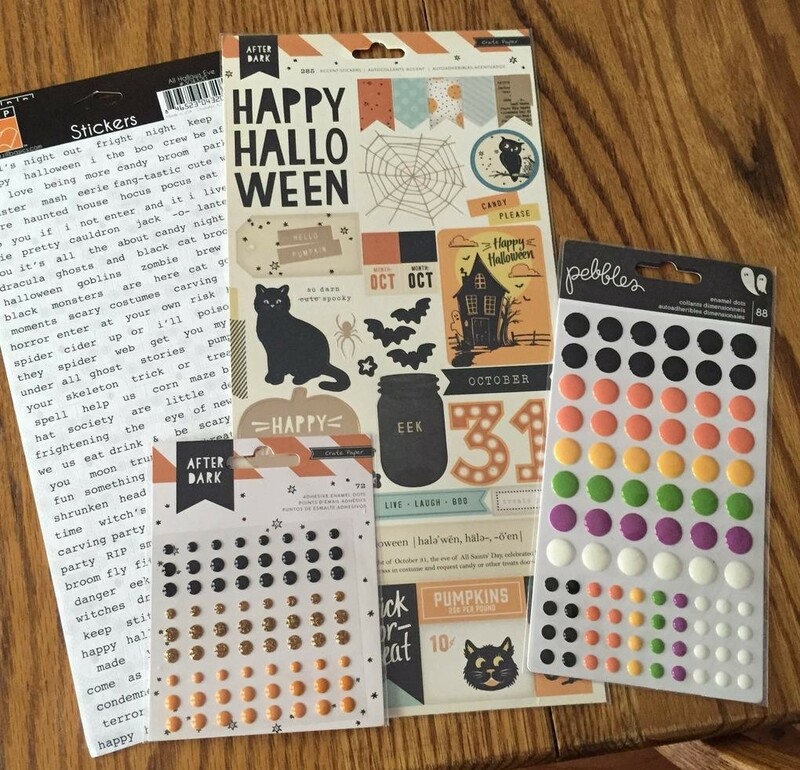 At the same time we’re cheering about the new stuff and great prices, I’m also hearing reports that some scrapbook stores that ordered the full new lines from American Crafts (who owns all these brands – Pebbles, Crate Paper, etc.) are only receiving bits and pieces. So interesting! 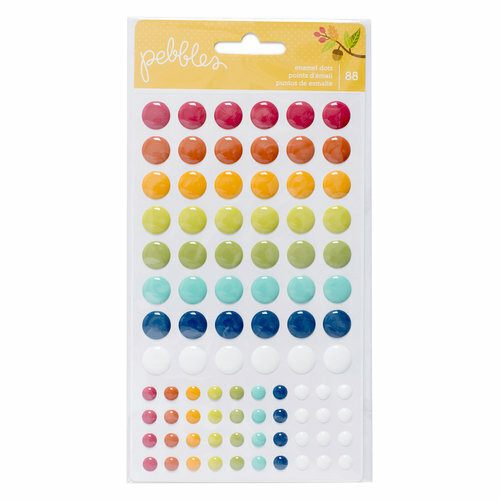 I did notice that Scrapbook.com has much of the Pebbles “Harvest” line, like these enamel dots I’m totally swooning over! 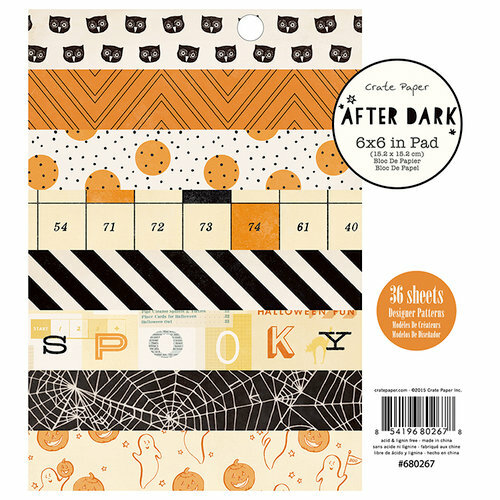 SB.com also has much of the Crate Paper “After Dark” line although several items are either on sale or out of stock. 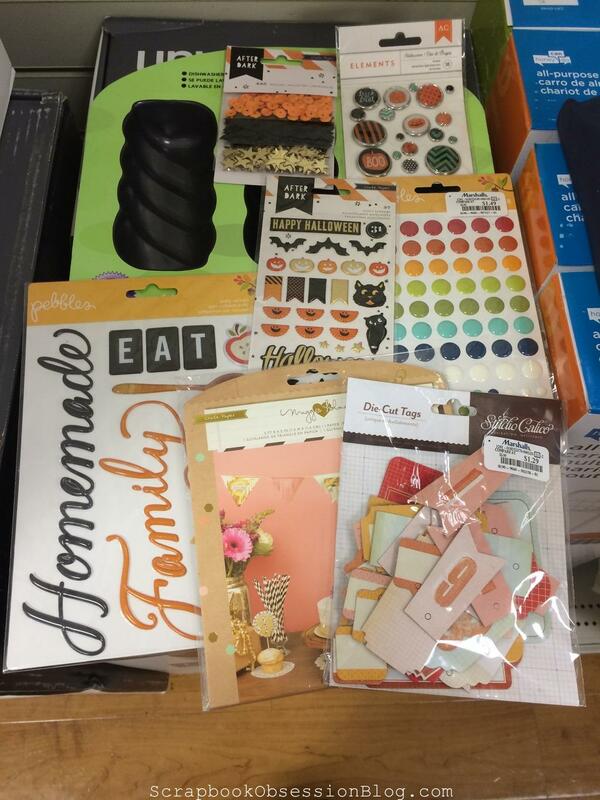 Are scrapbooking manufacturers selling directly to the big box stores now right out of the gate? Are they giving them preference over local scrapbook stores? Or are the items available for a discount at these big box department stores seconds or damaged somehow? Maybe it’s because these are super seasonal items that have a short shelf life, so to speak, so AC wants to sell them in the most expeditious way. Who knows? As a kind of side note, I noticed that Lisa Bearnson’s new line “Anthology” (for which I’m a consultant) includes some American Crafts and WRMK items packaged as Anthology – the 12×12 album, the pillow box punch board, and the tropical textured cardstock stack. I’m pretty sure the 6×8 album is re-branded Simple Stories, too. 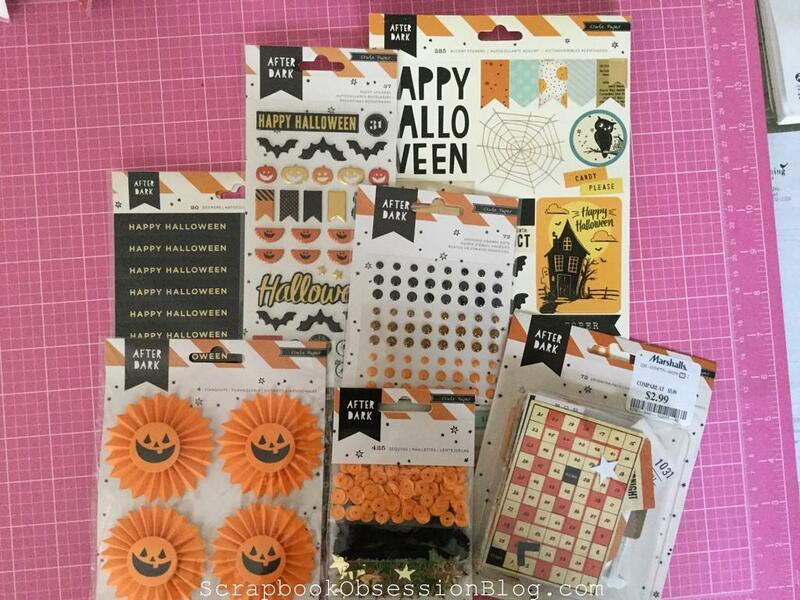 Overall, it seems the American Crafts umbrella is very diversified and, while I feel badly for scrapbook store owners, I can see the need to do that in today’s scrapbooking industry. I’m not criticizing American Crafts because I don’t know the facts but this just has me wondering: Have discount department stores become the new local scrapbook store? Will we continue to see brand new lines at prices lower than wholesale at these stores? 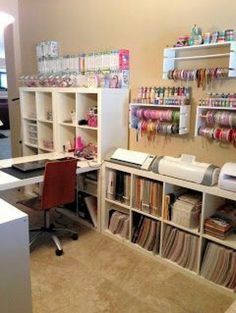 Or will things go back to the normal way of local and online scrapbooking stores having new lines exclusively for a while before the discount stores get them? Very interesting post. If out and about I may try to take a look at these stores. I hope this is not the trend, I prefer to shop online for just about everything now. But I do have a friend who loves TJ Max and Marshalls, maybe I will whisper a little suggestion to keep an eye out for me ! Im so glad that you are exploring this topic. 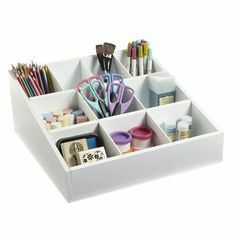 I too just hauled a TON of these lines at a few Marshalls and TJMaxx just Monday! I had an amazing shopping spree, but I was pondering all the same things you addressed! I had just placed an online order and didnt find lot of what I was looking for. I even got one of the two things I ordered from the CP After Dark collection refunded because it was backordered. In the long run Im happy that most of what I couldnt find I found for these amazing prices, but very confused. My conclusion is that Halloween/fall quick with xmas quickly taking over! 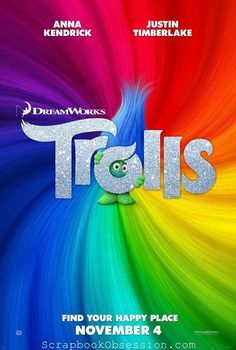 Hi Shari – Thanks for leaving a comment! So your experience was what I talked about, too – how interesting! 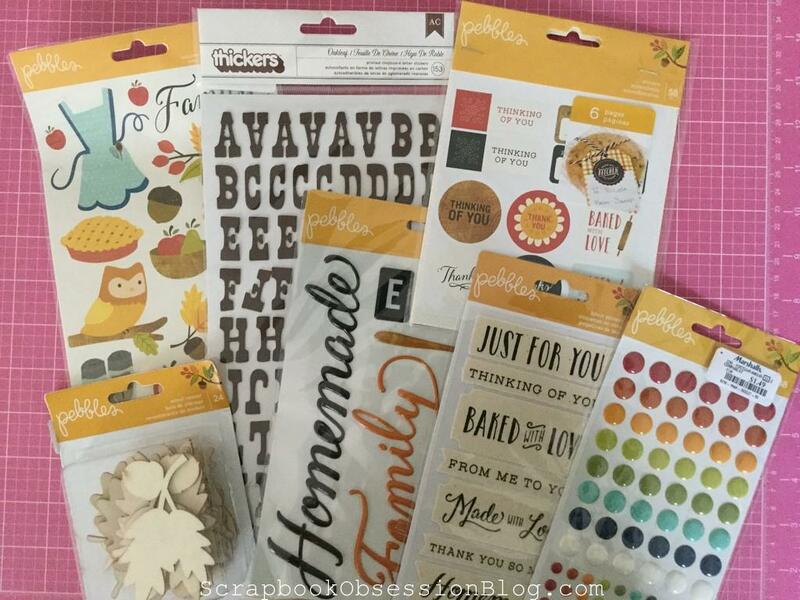 I’ve heard of 2 online scrapbook stores who didn’t receive full lines and therefore sent back what they did get – hard to sell papers without embellishments or vice versa. It is confusing. I think everyone has made a valid points. And the companies know their price points of cost and profit margins. Maybe it’s not all about the profit anymore but quantity that you sell? The more affordable the hobby is, the more people that will have demand for your product? It could bring in new people who yes, would like to preserve memories but have stayed away because it has seen (and face it) can be an expensive hobby. Big box stores may be the wave of the future because they can also purchase in large quantity and dispense to nationwide stores. While the LSS have to watch inventory levels, turn around times, and even with organizations out there to help with bulk purchasing must pay higher prices as they are buying smaller quantities…thus the cost gets passed on to the consumer to cover these costs plus provide a profit to keep the business going. Okay, I could rant on but I’ll stop there. You all know what I mean. Hi ya Julie! Oh my gosh, you put it so well. I agree with everything you said. 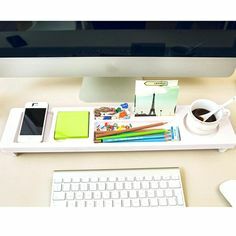 There are advantages to the companies for selling to both types of stores, and advantages to us as shoppers as well. I think a lot of us prefer to see products in person but if we don’t have an LSS anymore, big boxes are our only options to do that. 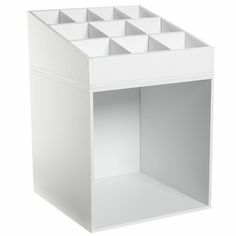 Yet who can be so patient as to say, “Oh, I see that my TJ Maxx has the brand new Crate Paper line. I think I’ll set these adorable tags down – that I want to go right home and do a layout with – so I can buy them from an online LSS.”?? Ha ha. It’s a conundrum. A similar trend emerged about ten years ago in the publishing world, where bookstores were closing down because they could not afford to match the prices of big box stores such as K-Mart (who routinely took a loss on blockbusters such as Harry Potter because the volume of sales in the store overall increased). It’s a Catch 22 – as a consumer, I can’t justify spending unnecessary money so I will generally take the cheaper option if the price difference is significant. But it’s not fair for some stores to carry at a loss at the expense of independent or small stores being able to carry at all. others were finding them in stores. I do wonder the ‘why’ behind it all. Hi Janet & thanks for the kind words :) Me too – just wondering if it’s a one-time thing or our “new normal.” It has to be so frustrating for the store owners and for customers like you who paid full price. 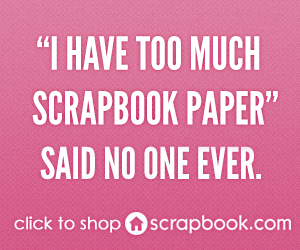 At least you can feel good about supporting your scrapbook store! But, still, ouch . . .